Each 1:64 scale Ertl Farm Country playset lets youngsters experience the best of country living, whether they live in the heart of the farm belt or the middle of the city. Included in each set are easy-to-assemble plastic buildings, life-like human and animal figures, and a generous helping of accessories for youngsters to harvest a bountiful crop of imaginary rural adventure. Features includes a die cast grain truck complete with functional auger and removable bin cover. 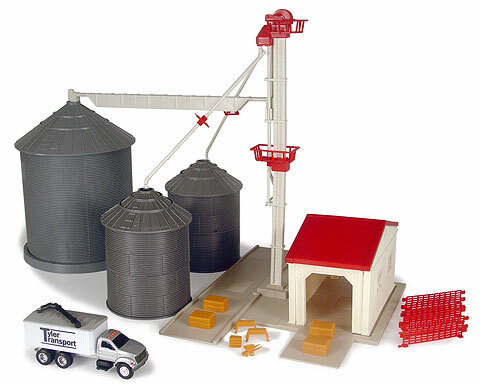 Set also includes three unique grain bins and all accessories shown. Compatible with most John Deere farm toys. I am not to happy with the price it is way to high. Other than that I kind of enjoy it I would not recomend it for someone who has a personal collection. Great set. But the bins are gray and not the chrome color they should be. And the set is kind of flimsy and has A LOT of small parts. Great toy; it could be used for a display, but you would want to paint the bins. Good for kids ages 8 and up. Excellent item, and it's easy to paint for a realistic look. I think I'll add one more to my O-scale layout. It makes my model farm look good. I also love the bags of seeds. My grandson has played with these toys more than any other toys he has or has had. They're pretty cool. awesome I like it alot and it looks good. I like your store i bought something here last year. These toys are awesome they are great for kids.